With Thanksgiving just days away, we wanted to drop some holiday day menu inspiration in your inbox. We all have our favorite holiday recipes, but if you don’t mix it up every once in a while you’ll never know what you’re missing out on! Step away from your holiday routine and give one of these incredible recipes a try – we know you won’t regret it! If you’re like us and love all things cheesy – this recipe for Brussels Sprouts Gratin courtesy of SkinnyTaste.com is the ultimate Thanksgiving addition! Simple, gooey and delicious it checks every box making it the perfect side dish for the entire family… kids included! This recipe for Creamy Garlic Parmesan Mac ‘N Cheese courtesy of CafeDelites.com offers a sophisticated twist on an all-time favorite. This simple, smooth and silky No Bake Pumpkin Cheesecake courtesy of TheRecipeRebel.com offers a scrumptious twist on a dessert classic and tastes like fall! There’s almost nothing better than coming home to a house filled with the irresistible aroma of a hot meal, which is why we absolutely love crockpot creations. 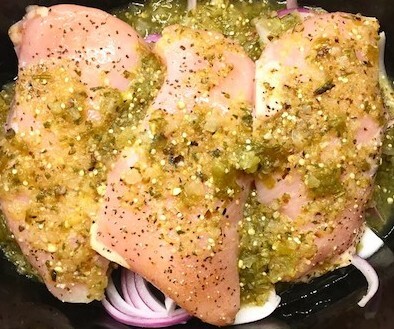 This week we’re featuring a recipe for delicious crockpot Roasted Salsa Verde Chicken with homemade salsa verde. You can, of course, use your favorite store-bought salsa verde, but this recipe is simple and really makes the difference — we’re confident that once you try it you won’t go back. Just toss a few of your Passanante boneless chicken breasts in the crockpot and enjoy this tasty meal for days! 1. Turn oven on broil. 2. Line a cooking sheet with foil. Place tomatillos, onion, and serrano pepper(s) on the cooking sheet. Place in oven and broil for 15-20 minutes, or until they are slightly charred and the tomatillos are very soft, squishy and oozing. 3. Add the roasted tomatillos, onions and serranos to a food processor with the lime juice, minced garlic and chopped cilantro. Puree. Serve immediately if you want it served warm, or place in a storage container and store for up to 1 week. Rinse and pat dry chicken breasts. Season with salt, pepper and cumin. Place 1/2 red onion, sliced, in bottom of crockpot. Layer seasoned chicken breasts on top of the onions. Stir together 1/2 cup of chicken broth and 1/2 cup homemade roasted salsa verde and pour salsa mixture over chicken. Cover and cook on low for 8-10 hours then shred using two forks. Throw on top of a salad, make some tacos or stuff and roast a poblano pepper! 1) When Storing: Refrigerate poultry promptly after purchasing. Keep it in the coldest part of our refrigerator for up to 2 days. Freeze poultry for longer storage and never leave poultry at room temperature for longer than 2 hours. 2) When Freezing: You can freeze properly packaged uncooked poultry parts for up to six months and a whole bird for up to a year. Freeze cooked poultry dishes for four to six months, and never refreeze chicken that has been thawed. 3) When Thawing: The safest place to thaw poultry is the refrigerator. For faster thawing, place the wrapped package in a large bowl of cold water and allow it to stand at room temperature for 30 minutes. Change the water and repeat the process until thawed. Never leave frozen poultry on the counter to thaw. 4) When Frying: Canola oil provides a much milder taste when frying, and it contains healthier amounts of saturated and polyunsaturated fats. Do not cover the chicken once it has finished cooking because covering will cause the coating to lose its crispiness. 5) When Cooking: For many recipes you can substitute one cut of chicken for another. Just remember that bone-in chicken pieces require longer cooking times than boneless pieces. At Passanante’s we are serious about delivering delicious foods to our customers, and the taste and quality of our meats are top priority. We don’t believe in grocery store lines, foods of unknown origin, or foods packed with bad-for-your-family chemicals – which is why we would LOVE to treat you to a free gourmet food sample. Curious to know what people are saying about us? Head on over to our Facebook page and find out why so many families across Maryland, Delaware, Virginia, New Jersey, Pennsylvania, North Carolina and Colorado trust us with their food delivery needs!